It's not just a Panel Cart, it's a Tool! Bars are designed with multi-point disconnection for easy transformation and storage. Our "4 Tools-in-One" design gives you the option of turning your Panel Cart into a Dolly, Platform Truck and an Inter-Connected multiple Dolly platform helping to move anything with efficiency and safety. The Snap-Loc Panel Cart crushes all competitors panel carts with its many unique features. 1,500 lb capacity with super heavy duty swivel casters allow you to move heavy loads with little effort. When needed use the Caster Brakes to firmly hold your load on hills. Patented 4 sided E-Strap attachment firmly holds cargo to Dolly frame allowing you to stack more without sacrificing safety or protection of cargo. The heavy duty steel bars are protected with a durable heat treated powder coat. Best of all, the Snap-Loc Dolly is Made in the USA! Logistic E-Strap attachment on 4 sides. Integrated steel frame with High Density Polyethylene body. Heavy duty all ball bearing casters with brakes. Flat top design with safety grip pads. The DEWALT DXST4500 4 Foot Tall, 3 Shelf Industrial Rack was designed and engineered to provide heavy-duty storage for both professional and home use. The three black laminate wood composite decks can each support an evenly distributed 1,500 lb. for a total of 4,500 lb. The uprights, crossbeams, and support straps are all made from powder-coated steel and are designed so that each shelf has 5 support straps to prevent them from twisting or buckling under pressure. The shelves are adjustable in 2.35-inch increments and the locking pins ensure that each shelf is properly installed. For added security, the rack has glass-filled nylon feet to protect flooring and a wall mount bracket to prevent accidental tipping. Each rack also includes 2 stacking plates to join two racks together vertically or connect them horizontally using the shelves alone. For easy assembly two uprights come with pre-installed horizontal and diagonal support beams making getting started fast and stress-free. KEEPER<sup></sup> tie-downs are designed to fit the application, so you have the right tool to meet your needs. Ratchet tie-downs with padded handles secure your cargo with maximum tension and minimum force, perfect for situations when you need proven dependability. These tie-downs are perfect for ATVs, hunting, fishing, and camping. The spring-loaded release mechanism guards against accidental release, combining safety with performance. With a 500 lbs. load limit and 1,500 lbs. break strength, Hi-Test<sup></sup> webbing in digital desert camo provides outstanding strength and withstands even the toughest applications. The webbing resists abrasion and the compact, non-marring vinyl coated S-hooks won't rust, so you can rely on KEEPER<sup></sup> ratchet tie-downs to meet or exceed your light cargo needs. SNAP-LOC Panel Cart Dolly, Red It's not just a Panel Cart, it's a Tool! Bars are designed with multi-point disconnection for easy transformation and storage. Our "4 Tools-in-One" design gives you the option of turning your Panel Cart into a Dolly, Platform Truck and an Inter-Connected multiple Dolly platform helping to move anything with efficiency and safety. The Snap-Loc Panel Cart crushes all competitors panel carts with its many unique features. 1,500 lb capacity with super heavy duty swivel casters allow you to move heavy loads with little effort. When needed use the Caster Brakes to firmly hold your load on hills. Patented 4 sided E-Strap attachment firmly holds cargo to Dolly frame allowing you to stack more without sacrificing safety or protection of cargo. The heavy duty steel bars are protected with a durable heat treated powder coat. Best of all, the Snap-Loc Dolly is Made in the USA! 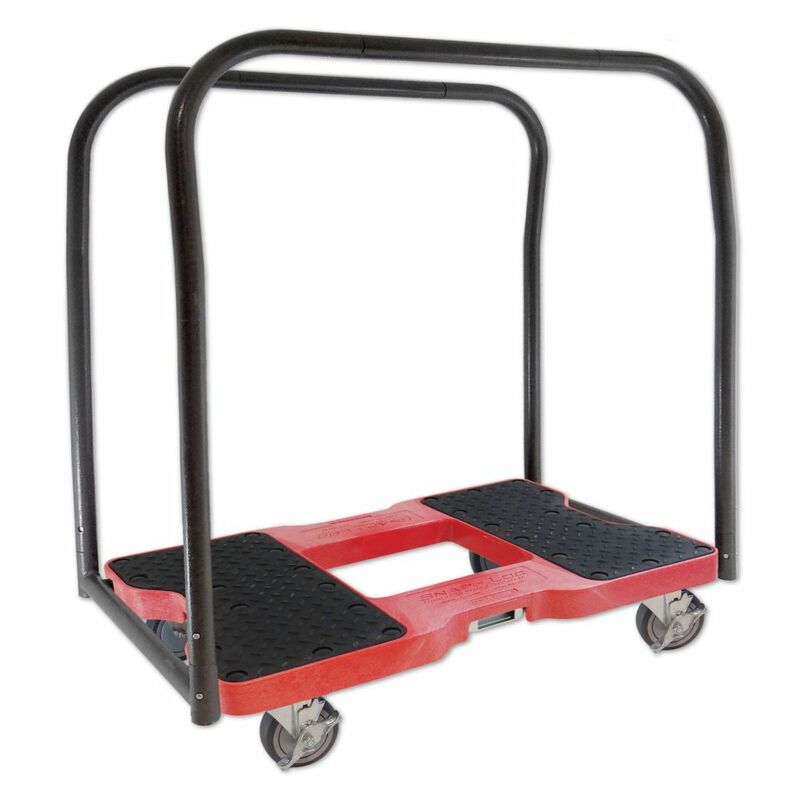 SNAP-LOC Panel Cart Dolly, Red is rated 4.8 out of 5 by 5. Rated 5 out of 5 by Chief from It was very easy to put together and is very durable. We have had them for about 2 weeks and what... It was very easy to put together and is very durable. We have had them for about 2 weeks and what we are using them for worked out perfect! Rated 4 out of 5 by panelcart from The cart was easy to assemble and works well for us. The handles are a bit wobbly but other than... The cart was easy to assemble and works well for us. The handles are a bit wobbly but other than that it is good and sturdy and carries our 600 pound load reliably. Rated 5 out of 5 by Diane from Easy to assemble. Heavy duty and perfect for what I... Easy to assemble. Heavy duty and perfect for what I bought it for. Rated 5 out of 5 by Brian from This is a thoroughly made, tough cart. Great buy. I... This is a thoroughly made, tough cart. Great buy. I load 185 # stage pieces on it, and it handles them easily. Rated 5 out of 5 by Anonymous from These carts are fantastic! They roll great and are... These carts are fantastic! They roll great and are versatile with removable bars.